For seventeen years the Pacific Northwest (Oregon) group Agalloch has defined what it means to combine influences from a variety of musical genres into one brooding, colossal, and cinematic sound that provides the soundtrack to existential themes concerning man, nature, loss, and death. After two demo releases in the late 90s the band released three full-length albums: ?Pale Folklore? (1999), ?The Mantle? (2002), and ?Ashes Against the Grain? (2006). After two demo releases in the late 90s the band released three full-length albums: ?Pale Folklore? (1999), ?The Mantle? (2002), and ?Ashes Against the Grain? (2006). ?The Mantle? has since been heralded as a classic for having been one of the first albums to combine elements from black metal, neo-folk, progressive rock, post-rock, and ambient music. The influence of this record can be seen in many so-called ?post-black metal? bands today. 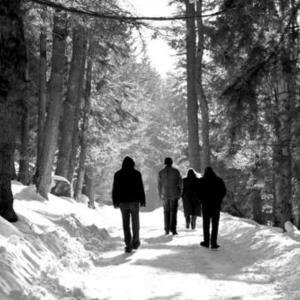 In 2008 Agalloch began re-releasing their demos, B-sides, and EPs under their own Dammerung Arthouse label. In 2010 their fourth album ?Marrow of the Spirit? made number one on numerous critic's top ten lists. In between each of these full-lengths the band pushed on the flexible boundaries they had developed around themselves through a series of EPs that found the band experimenting with post-rock/instrumental rock (?The Grey,? 2004), neo-folk/psychedelic folk (?The White,? 2008) and most recently a mammoth twenty-minute epic work entitled ?Faustian Echoes? (2012) released through Dammerung Arts. Agalloch has earned a reputation for explosive and emotional live performances. They have sold out tours across Europe and the US and have played a variety of major festivals including: Roadburn, Noctis, Inferno, and Scion among others. The band takes special care constructing the environment of each and every show with wood, incense, and imagery taken directly from their home in the Northwest. Such care makes an Agalloch show more than just a typical heavy metal concert.